Skyrim is renowned for allowing the player to play exactly how they want. 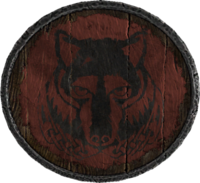 You can dual wield axes, use a two handed weapon, use a bow or do what I personally like to do and wield a shield and sword. This method allows you to block enemy attacks and counter with your own, it’s very effective. If you already utilise this setup or want to in the future, you might want a list of the best shields in the game. Here’s the 10 best Heavy Armour shields in the game! I will also provide a way of obtaining them. (SPOILER) How to obtain: Craft in the Aetherium Forge. This was a difficult one to place at number 10 but I think it is the correct position. It looks unique and awesome but the base armour amount lets it down, as does the enchantment. 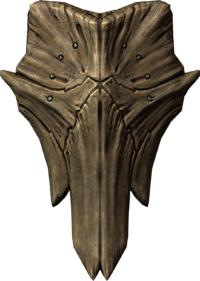 Any enemy hit with this becomes ethereal, this might be good for escaping enemies or balancing the odds if you’re against a group but that’s about it. Overall it isn’t worth the huge amount of effort required to obtain it. (SPOILER) How to obtain: Loot. 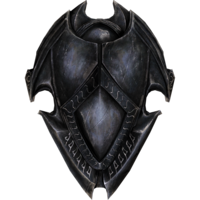 The Falmer sure now how to build some strong armour, this shield can be easily obtained from any Falmer wielding one. It provides a very respectable base armour amount which can help you out when you’re at a low level. (SPOILER) How to obtain: Craft or loot. 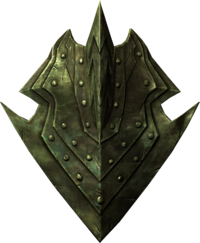 The Orcish Shield is a very sturdy and cool looking shield that can serve you will through the mid-levels. The high base armour and easiness to obtain are what puts is above the other entries. 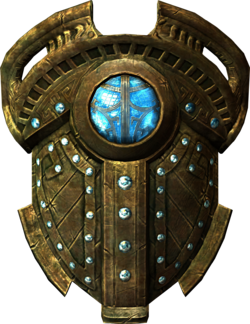 Pretty much the same as the Orcish Shield except it has a bit more armour. It is a bit rarer as you only find Ebony items at a higher level but overall it is deservedly in 8th place. 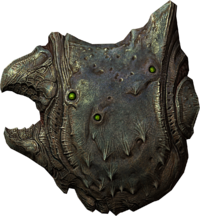 Arguably the ugliest shield on the list but one of the more powerful. 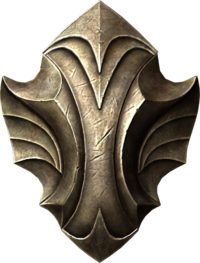 This shield boasts the third highest base armour amount in the game. The downsides? Well you’ll have to be extremely lucky to loot one of these in a chest and crafting it requires a very high Smithing skill. 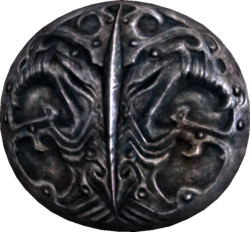 This shield can be fairly easy to obtain but if you want other items you might want to save your Daedric Hearts for something else. It’s a very rare find in chests but I think this is justified as it has the second highest base armour in the entire game! (SPOILER) How to obtain: Ysgramor’s Tomb during the Companions questline. 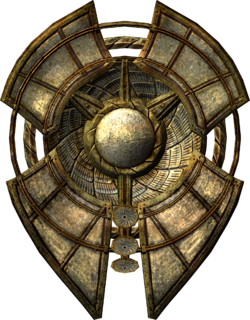 This shield increases your Magic Resistance by 20% and your Health by 20 points. This won’t make a huge difference at a high level but you can get this relatively quickly and make your journeys to high levels a lot easier. (SPOILER) How to obtain: Falk Firebeard gives it to you after completing the The Wolf Queen Awakens quest. The Shield of Solitude is a very interesting shield that provides a lot of cool enhancements. The first one is that is increases Magic Resistance by 30%, it then also blocks 35% more damage. Combine this with the high base armour stat and you will be taking a lot less damage. However, the huge downside is that you have to be level 40 or over to get these full effects, which is why it doesn’t get closer to the number 1 slot. (SPOILER) How to obtain: Kill the Falmer Warmonger inside the Forgotten Vale Forest. This shield is very powerful, as you block attacks it builds power which is released after power bashing. After 15 hits, the power bash will be as strong as a Fus Ro Dah! 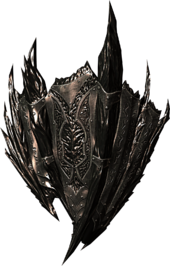 As you can see, it’s a very good shield overall but is difficult to obtain, which is why it misses out on the top spot..
(SPOILER) How to obtain: Complete Peryite’s Daedric Shrine quest. Spellbreaker has the highest base armour stat of any other shield in the game. It has a unique Dwarven-like look, it’s a lot better looking than the Oblivion counter-part I used to love so much. When blocking it summons a ward that can protect you from spell damage, so if you’re wielding this you have a huge advantage over every enemy in the game!